Mitchell County was created in 1857 from a portion of Baker County that lay east of the Flint River in the heart of southwest Georgia. Camilla, Georgia was incorporated in 1858 and in the same year, one year after the founding of Mitchell County, named the county seat. Mitchell County is named for General Henry Mitchell of Hancock County, who was a great leader in the movement for independence during the Revolutionary War and for many years presided over the Senate of Georgia. Camilla was named in honor of Miss Camilla Mitchell, the nineteen year-old granddaughter of General Henry Mitchell. Due to a death of residents and the intervention of military occupation, no city elections were held until 1868. Since that time Camilla has been blessed with efficient and forward-looking city administrations. For example, instead of “granting” electrical power distribution to franchise companies, Camilla instituted its own electrical system, thereby assuring its citizens affordable electricity and, simultaneously, lowering property taxes with the “profits” from the sale of electricity. Furthermore, Camilla is currently installing a city-owned, high speed data transmission system for homes and businesses. Camilla is at the center of one of the most efficient irrigated agricultural production systems in the world. 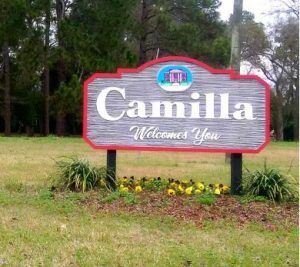 A myriad of crops and products such as peanuts, pecans, pine trees, poultry, cotton, cattle, and vegetables are grown in the fertile fields surrounding Camilla. Most of these products are further processed in Camilla, thereby giving employment to her people and profit to her businesses. Camilla has a proud history and a great future.